I wouldn’t have thought I’d have felt this way, but let me go ahead and get it out there as we begin: I’m perhaps starting to get just a liiiitle worn out of Vampires in Magic preconstructed. Black Weenie/Swarm is a fine strategy, but it seems like just a bit much on the flavour as we crack into the third Vampire-themed intro deck in less than a year. For the longest time, Vampires had a checkered history in Magic. With rare exception, the early ones borrowed more heavily from Count Orlok than Lestat. Observe, then, a brief origin of the species, and some thoughts on the future. Early Vampires were all but devoid of the ‘sexiness’ we now associate with them. Indeed the first-ever Vampire, Sengir, seemed to set an early tone by lapping at some veins and arteries (though in a twist two years later, would have a momentary redemption). Two years after the release of the game, Vampires would defy their early conceptualisation and stand at a crossroads, as Homelands introduced us to the Sengir clan. Possessing the same predatory will as their predecessor in the card pool, Homelands chose to infuse its vampiric antagonists with a healthy dose of aristocratic bearing more in line with the romantic notion of the vampire found in popular culture. Although the cards themselves reveal only Legends, Oracle shows them properly errata’d to be a Vampire, Vampire Dwarf, and Human Wizard, respectively. Despite her suspect appearance, in the lore ‘Grandmother’ Sengir is a Bathorian mortal who sustains her unnatural lifespan through the fluids and essences of young women. Bon appetit! It would take quite awhile for things to come full circle, and indeed, judging from some of the cards released vampires hit a very deep and bestial low. Yikes! From the gangly Treacherous Vampire to the more alien Mephidross one, it seemed a race to the bottom to see which one could be more bestial and hideous than the next. 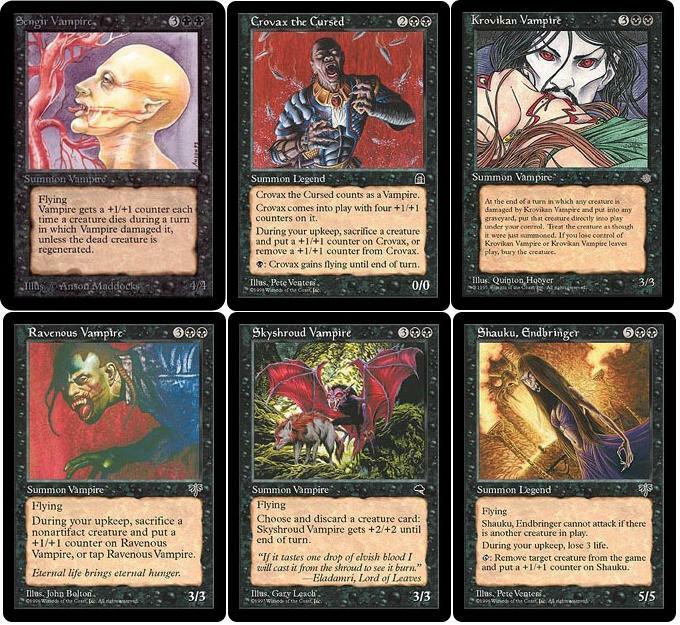 Adding insult to injury, Vampires at the same time were widely marginalised, typically assigned as Rare cards with some flavourful powers but given no tribal support. A search today of Gatherer yields only 55 cards with a subtype Vampire, and bear in mind a large chunk of those were from only very recent sets. But why the relegation to the fringes? Why so little love for the bloodsucker? Zombies! 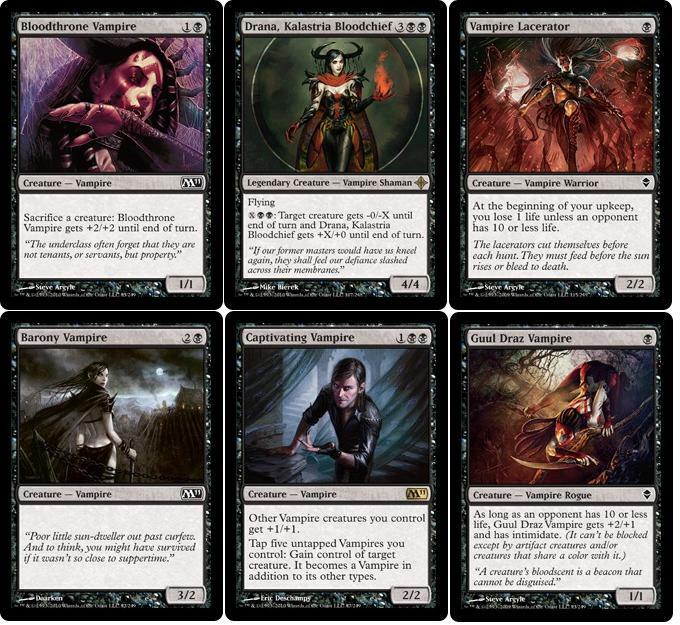 From very humble beginnings indeed, Zombies quickly became Magic’s Black tribe of choice, with over four times as many cards with subtype Zombie in it as Vampires, which doesn’t even begin to include other cards for Zombie support, be it Enchantment (Zombie Infestation), Instant (Cruel Revival) or even non-Zombie creature (M11’s Grave Titan). At some point, Wizards had weighed their options, and put the Vampires on the back bench. It would take a stirring in popular culture, along with a back-to-basics approach from Wizards to generate the seismic shift needed to vault the vampires into the spotlight. A few years ago, as Zendikar design was reaching a close and Magic 2010 was getting underway, fortunes began to change for the Vampire deep in the bowels of WotC. The romantic ideal of vampirism which has periodically flourished only to die down again (see: 1994’s Interview with a Vampire, 1987’s The Lost Boys, etc… pop culture is a study in recycling) surged back to unlife in the form of Edward Cullen, True Blood, etc. So what can we expect from Vampires in the future of Magic? First, I wouldn’t expect them to fade away anytime soon. Having a strong Core Set (M10, M11) presence means that in one form or another they’ll be sticking around for awhile. 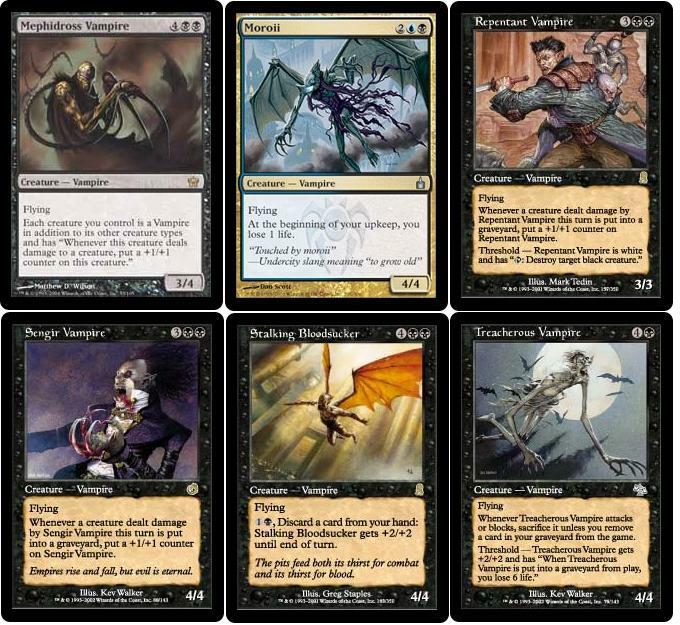 And while all of 2003-04’s Mirrodin Block contained exactly one Vampire, he was a flavour doozy (turning all of your other creatures into Vampires). We won’t know until this Autumn how great a role Vampires will play in Scars of Mirrodin, but it’s a safe bet they’ll be there. Thematically, Vampires had a strong role in Zendikar block, but set after set we don’t really connect Golbins or Elves with any particular set or story arc. They’re just always… there. You can expect the same from Vampires. That said, there’s still a ‘novelty factor’ with the tribe, as evidenced by their overt presence in recent theme decks, as mentioned at the start of the article. Look for that to die down as well once the tribe becomes “normalised.” After all, it’s not too often you find a tribal-ish theme deck featuring Goblins (Scourge’s Goblin Mob and Lorwyn’s Boggart Feast notwithstanding). It does look, though, that the Vampire is here to stay… even when Edward Cullen and his ilk fade into temporary obscurity.